Organic Pest Control – Is It Just About the Soil? As I’ve said many times over the past six years when writing for TMG, healthy soil consistently enriched with organic matter is first and foremost in guaranteeing the success of your garden. Healthy soil feeds our plants, and it helps protect them from diseases and pests. Plants grown in poor soil that don’t have good soil life to help them be healthy, literally put out signals that call to and attract the bad bugs. Does Healthy Soil Guarantee No Pests? I’ve heard and/or read of some pretty well-known gardeners who have indicated that you won’t have any pests if your soil is healthy. I certainly would not argue with the fact that the more your garden soil improves, the less problem you’ll have with bad bugs. I’ve experienced that first hand over the years in my garden. But not having ANY bad pests will depend on more than just soil. 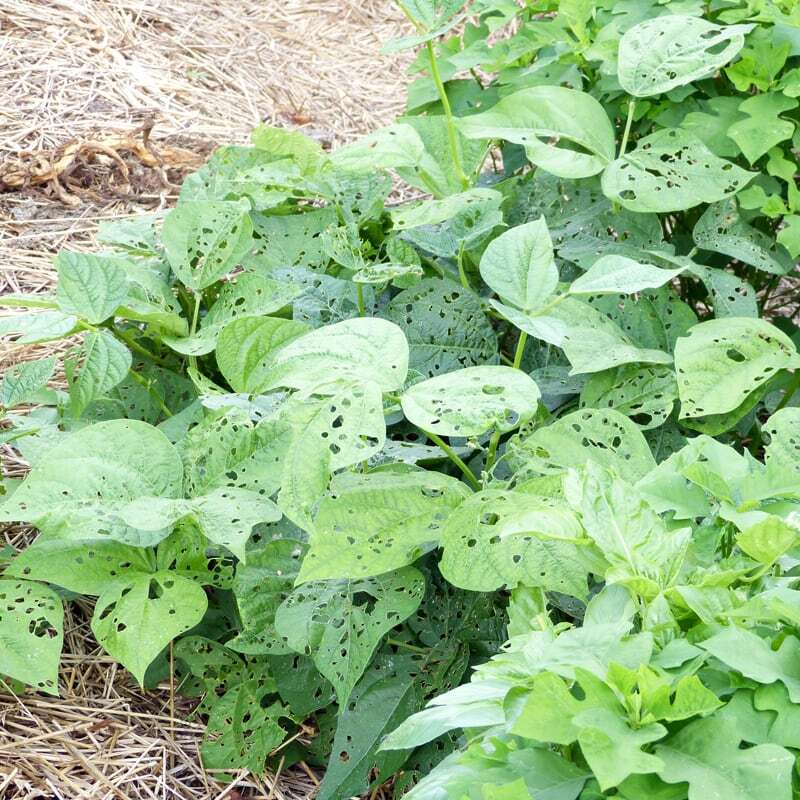 Temperatures and rain fall can make a huge difference in the number of pests that visit your garden. Rainfall here this year has been just about perfect except for maybe 3 weeks. And, except for an extremely hot day, temperatures stayed pretty moderate until mid July. I’ve been amazed at the difference these two variables caused in my garden this year. Usually, Harlequin Bugs start dining in my garden in June. The various cabbage worms join them and make lace of most of the previously beautiful kales and chards. These guys didn’t even put in an appearance this year until mid July and the numbers are no where near what they were last year! 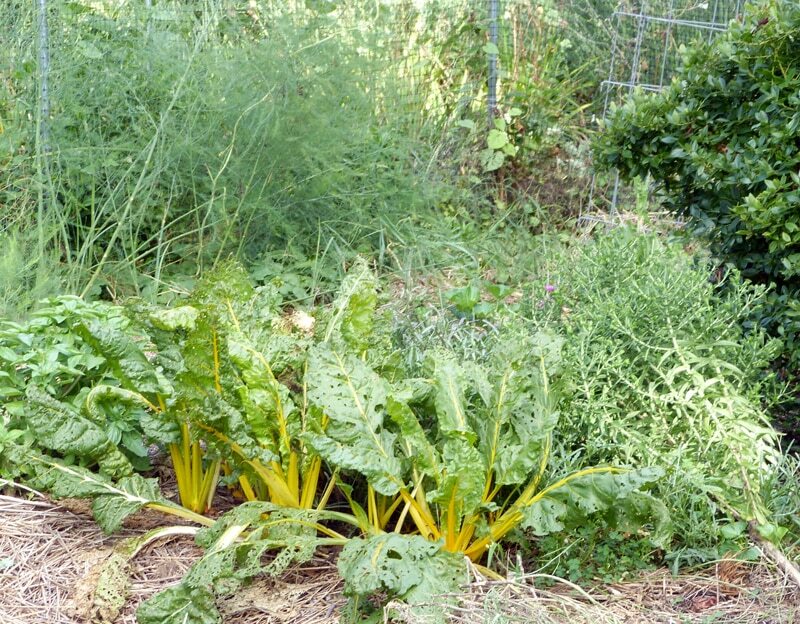 Chard is looking pretty shabby, but should make a come back when the weather cools. 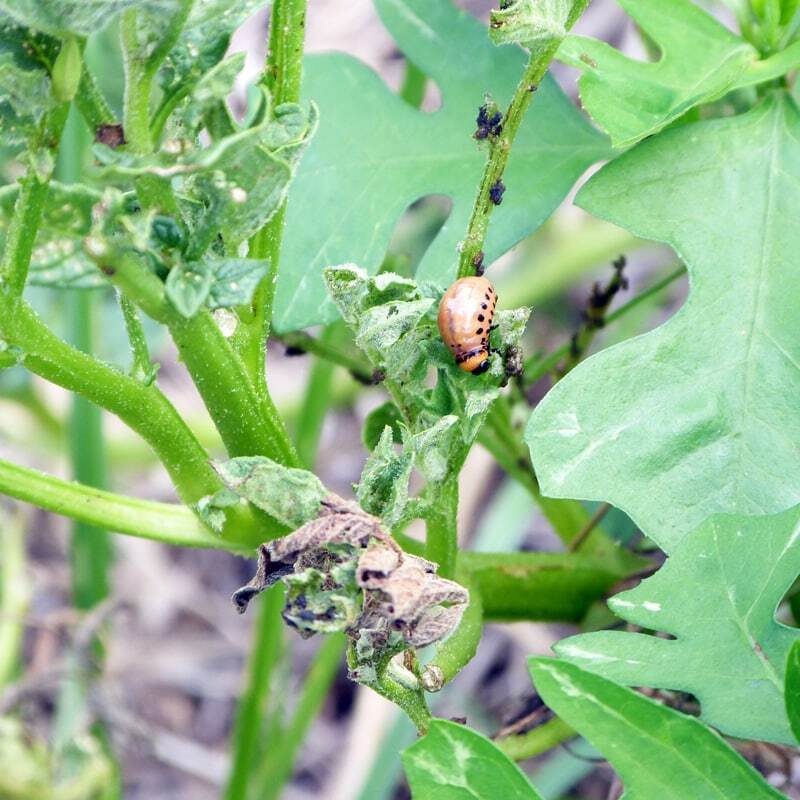 Also noticed that the harlequin bugs have dined on arugula plants in one section of the garden, but haven’t touched the arugula in other sections. Years ago, potato beetles were so numerous in my garden I had to “search and destroy” 3 times a day. I hated it! In recent years, I don’t have many at all. This year I only saw a few adults and a few clusters of eggs and maybe a dozen larvae. They didn’t show up until late June and I killed those. Today, I was very surprised to see last-stage larvae on a “finished” potato vine. I killed those and made a note to check for the beetle next year when my volunteer potatoes come up in that area. I don’t know if I missed any of the larvae, but if I did the adults will probably stay in that area and winter over. In prior years I’ve always planted about 40 tomato plants. I’ll usually see a total of about 3 or 4 horn worms. By the time I see them they’re usually already covered with the white cocoons that look like grains of white rice. The tiny braconid wasp lays eggs inside the horn worm. When the eggs hatch the larvae eats it’s way out and spins these little cocoons which will hatch the adult wasp. These little guys must get these worms pretty quickly because they don’t do enough damage for me to notice them quickly. This year I only planted about two dozen tomatoes. I was surprised a few weeks ago to see 3 hornworms without the cocoons. I killed them. That evening it occurred to me that I may have been too hasty in doing that. The worms were not active which would indicate they had already stopped feeding and had been paralyzed by the eggs inside of them. 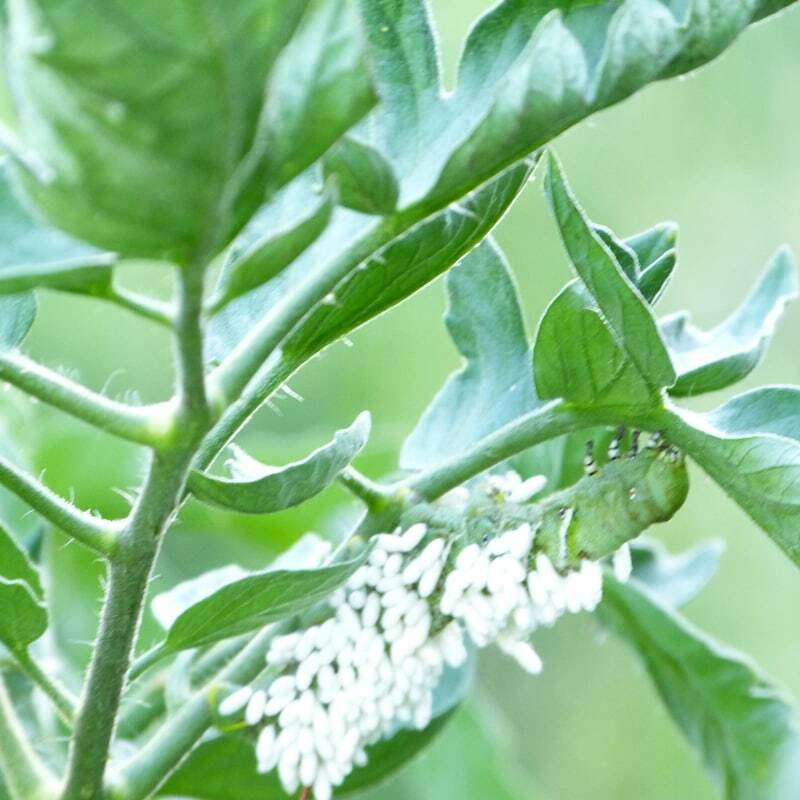 By my killing them, it probably stopped the process and thus, my garden lost the benefit of all those braconid wasp that would have hatched to help me with pest control. You gotta have some bad guys so the good guys can multiply. Everything in nature is balance. I resolved not to kill anymore if I found them. And surprisingly, I did find about 6 (with the cocoons) more making the total of horn worms this year about 10; 6 more than what I usually find. Hate the squash vine borer! Never seem to see signs until it’s too late. Had a zucchini squash that was a gigantic plant one day in June and dead as door nail the next. Just yesterday found signs of the borer on one smaller stem, but the main stems look great. Hope that will continue because I’m getting beautiful squash. One or two medium squash every other day. And they’re delicious! These bad boys didn’t even make an appearance in the garden until mid-June on the zucchini I mentioned above. My cucumber plants are gigantic and I’ve only seen one squash bug on them. That makes me happy! And yes, the braconid wasp is said to lay eggs on squash bugs. I’ve never seen indication of this in my garden and would not depend on this little wasp to keep squash bugs at a controllable number. They’re out there, but not in large numbers. As you know, they spread that wilt disease and that’s usually what finishes off my cucumbers. As a rule, by mid-August cukes in my garden are on their last leg, but as of today they still look great. Have seen 6 and killed 5. No where near as numerous as last year. I see them mainly on tomatoes. About one per plant when I check each day. I’ve seen a few on the cucumbers and a few on the asparagus ferns. Very controllable this year. Not too many. It’s been years since I’ve had any noticeable holes in the leaves of snap beans from bean beetles. This year I did. Didn’t see the beetle until just the past few weeks. The beans are doing great; they just have holes in the leaves. I can live with that. Plants that are stressed will signal to and attract bugs. Although healthy soil is your first line of defense, keep the other variables in mind. Extreme temperatures and uncovered soil can cause conditions that promote stress for your plants. Lack of rain fall for a long periods of time can stress plants. If you have the means to water and have water free of chemicals, you may be able to prevent this stress. If you’re over watering or watering with water that has chemicals (public water) you’re probably exchanging one stress for another. And last but not least, your daily “search and destroy” duties can make a huge difference in not allowing pest populations to build. How are the bugs in your garden this year? All content includes photos is copyright by TendingMyGarden.com. All Rights Reserved. Not too much bug damage this year other than the worms on the kale. Like yours, mine came late so I got lots of kale. But they came later !I was trying to let the kale go to seed, but instead it was completely destroyed by the pests. I am wondering, since they came so late, will they stay longer and be a problem for fall-planted kale and broccoli too? Another question: For the first time ever, I found a few bright orange, leggy bugs with a body about 1/4 inch long–on my black-eyed peas? Each morning for about a week, I would find several on just one pod. When I tried to squash them, most would fall to the ground and disappear. Does anyone know what they were? I truly have no scientific evidence to support my theory, but what started as one rogue purple leaf basil that self seeded so prolifically the past two years seems to deter a number of pest problems in my vegetable garden. I’ve pruned the tops of the plants for the past month and every few days wrap the leaves around the stems of my zucchini. So far all but one of the zucchini are still alive, altho vine borers appeared to be present when I started this experiment. The basil looks gorgeous in the garden as well. There are so many basil plants I pull them at will and leave them lying in place to cover any gaps of bare soil. I had small grasshoppers this spring. They were less than a half inch long and attacking my bell pepper plants. I bought a jalapeño pepper, ran it through a bullet blender with water and strained it to remove the solids. I sprayed a couple of times, and no more grasshoppers. I could have added a drop or two of dish washing liquid, but didn’t. It worked anyway. Good getting your update Ray. And yes, I too agree that full coverage before the blossoms start really helps like nothing else can. Betty, my kale did not come up late. It was in the garden since last fall and was 5 to 6 feet tall by May and just gigantic. I was thrilled to have no bug damage until summer was well under way. I let my kale seed. After that I cut it down. Last month all kind of seedlings started coming up in various places. The strongest plants will make it just fine. In addition to that, more seed will germinate before cold weather. I work on “search and destroy” with the harlequin bugs and cabbage worms but since there are thousands of kale leaves, I’m not as successful in getting them all as I’d like to be. This year I won’t let quite as many Russian Kales winter over. My original “undoing” with the harlequin bug was ignoring it when I started planting more brassica. That allowed them to multiply; several generations in a season. And they can winter over in the garden. I’m going to stick to a strategy next year. They usually start in one section of the garden. I’ll heavily patrol that area when they start and hopefully control the spread immediately. I’ll have to be diligent with my plan to get the numbers down to a more manageable number. I also have the borer. And the plants are indeed gorgeous growing in the garden and as you said it’s great to pull the extras and use them to cover any gaps of bare soil. Great input Frank! I’m sure a lot of folks will use this tip. Glad you liked the post. Appreciate your letting me know. Well I think this is an outstanding article! Thank you Theresa. I have never seen a potato beetle. The picture is so helpful. Also, the reminder to help nature stay in balance is an important one. I sometimes step in at the wrong time and in the wrong way. I am always looking to learn when and how. Our actions effect things that we aren’t aware of sometimes. 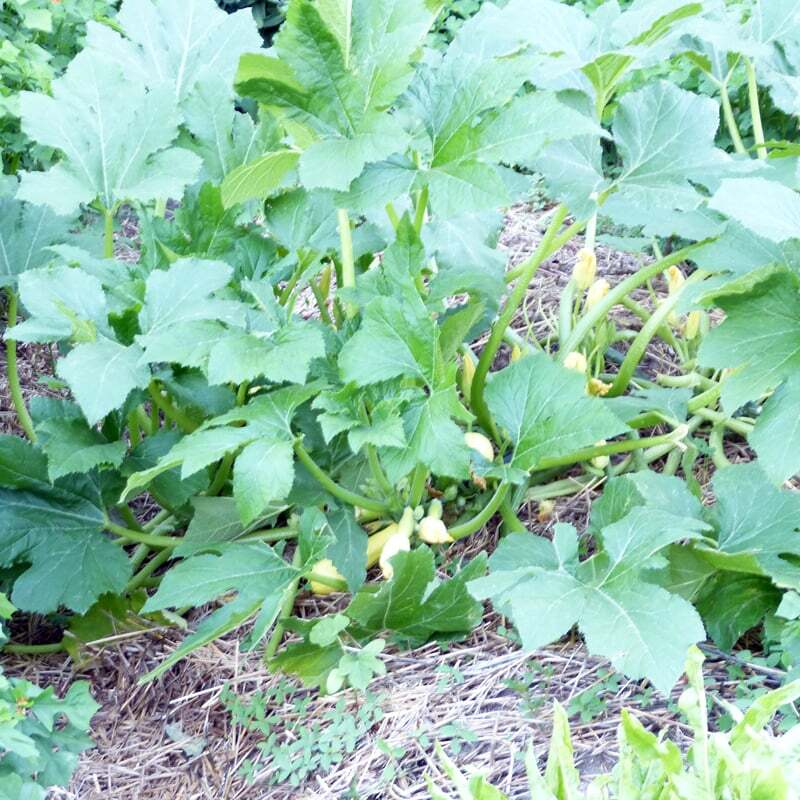 What plants are on either side of your yellow squash? I am so glad you posted pictures of your beans with the note they are still producing. I see so many people destroy plants in a panic that look similar to that. My bean plants in past years have looked much worse than yours but have pushed through to give me great yields. Thank you again for the fantastic article with pictures and explanations. I’m so pleased that you found this post helpful Toni. The picture is the larvae of the potato beetle that will soon be an adult. For pictures of the adult just Google “pictures of potato beetle”. The plants on either side of my yellow squash are summer pointsetta. It’ll get very tall in the next month and the center leaves of the plant turn blood red. Quite beautiful. It reseeds in my garden and I use it as a natural cover in various spots. In late fall I pull it up and drop it on the beds to decay (and return again next year). I enjoyed this post so much! We seem to be having similar experience with the bugs this year. Most of the old familiar ones arrived later this summer. The exception was a horde of asiatic garden beetles that showed up in June near the asparagus bed. I had never seen them before. As always, I love the photographs of your garden, even the ones showing bug damage. Keep them coming, please! I wonder if having conventional farms next door could make an impact on the pest situation. I figure they have to eat and if, one year, the farmers plant corn and the next soybeans, would this change where and how they found their food, how they reproduce, etc. Pat, I’m so glad you enjoyed the post and love the photo — even the ones showing bug damage. As a rule, we never see someone post pictures of crops that look bad, but it’s good to know it can happen. I appreciate all who let me know they like this kind of post, because it will encourage me to do more for you. 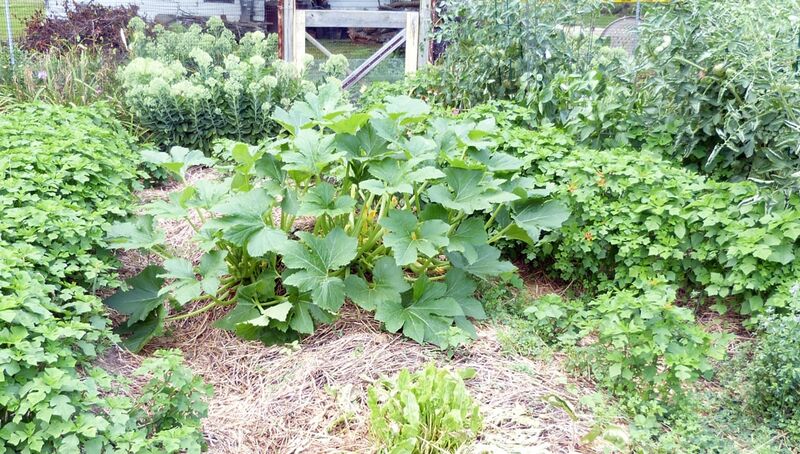 Farming Bear, conventional farms next door absolutely make an impact on gardens. One example from my garden is the corn worm. In years that they plant corn across the road I have those corn worms in my tomatoes. This year — a no corn year — and I have only seen one worm. The good news of course, is that the healthier our soil — we still stand of a better chance of that not making as much of an impact as it would otherwise. 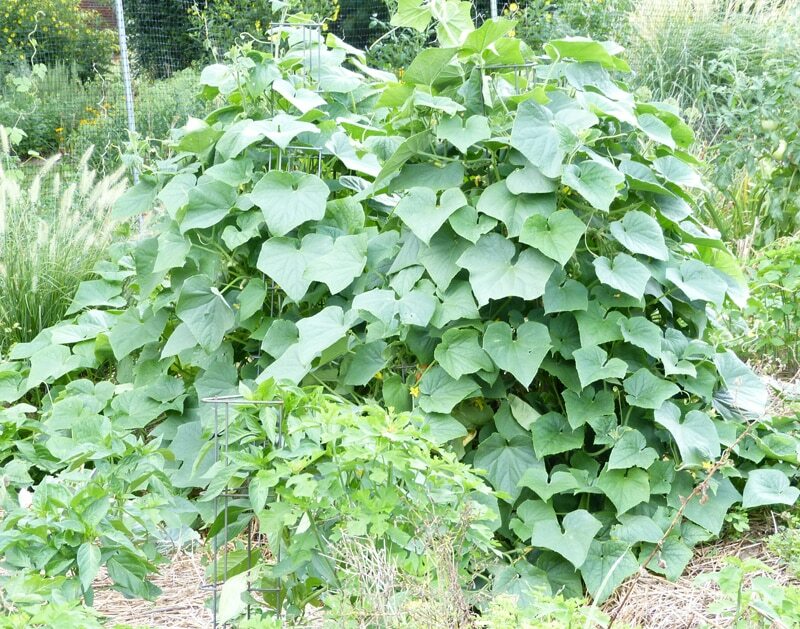 I have been growing my cucumbers on a trellis, actually a fence now, and the squash bugs don’t bother them if they are not on the ground, plus my cucumbers are more straight. Any tips on how to get cucumbers to grow further into the season. Mine are almost done now. Over the years, I’ve also found that to be true Don — that the squash bugs don’t bother them (as much) if they are not on the ground. And that cukes are more straight — except at the end of the life of the vine. As far as extending the season (on anything) — succession planting is the way to go.